I picked up a copy of Family Circle magazine almost 2 years ago because of the picture on the cover. 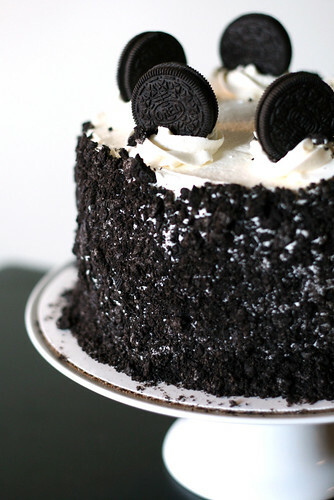 It was of a cake that I knew Jesse would love. I tucked it away, planning on making it for his next birthday. Then our world was flipped and flopped and he spent the next birthday in China. I made it up to him by bringing cupcakes the next month when I flew to San Diego for a visit, but I didn’t forget about this cake. Thankfully (for my cake baking sake) this year he didn’t have to leave for China until after his birthday! After cracking open the magazine and getting a good look at the recipe, I decided to make a few changes. 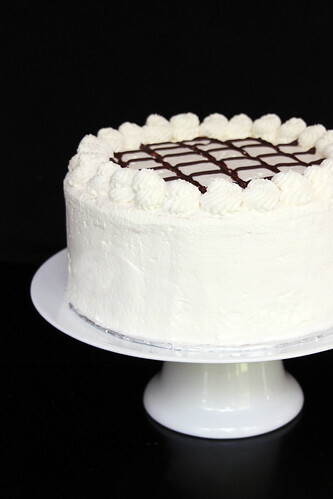 The magazine recommended a cream cheese frosting filling between the layers and whipped cream to frost the outside. I love cream cheese frosting, but it’s probably Jesse’s least favorite, and honestly it didn’t fit with my cookies and creme vision. So I decided to go with what is quickly becoming my go-to frosting for chocolate cakes, Fluffy Vanilla Frosting. Like I said when I used it for the Cherry Coke Cupcakes, the milk in it gives it a whipped cream like taste but it’s as sturdy as a buttercream. So I decided to use it instead. And it worked perfectly. Preheat oven to 350 degrees. Prepare two 8-inch cake pans with butter and flour. Into a medium bowl, sift together flour, cocoa powder, baking soda, baking powder, salt. Set aside. In the bowl of a standing mixer, or a large bowl using a hand held mixer, beat together the butter, sugar, and vanilla until light and fluffy. About 3 minutes. Add the eggs one at a time, beating until incorporated and scraping down sides as needed. With mixer on low speed, add 1/3 of the dry ingredients, mix until incorporated. Then add 1/2 of the buttermilk, mix until incorporated. Repeat until the last 1/3 of flour has been used. Mix until incorporated and then beat for 1 additional minute. Divide the batter evenly between the two prepared pans. Bake for 35-40 minutes, or until a toothpick inserted into the center comes out clean and the sides begin to pull away from the edges. Allow to cool in the pan on a wire rack for 10 minutes. Turn the cakes out onto the racks and allow the cakes to cool completely. While the cakes are baking, prepare the frosting. In a saucepan, whisk together the flour and milk and cook over medium heat until the mixture thickens (I would compare it to mashed potatoes). It is very important to whisk continuously so clumps don’t form. This took me about 4-5 minutes, but it’s best to go by texture. When the cakes are completely cool, cut each cake in half* horizontally. Use 1/3-1/2 cup of frosting to fill between each layer. 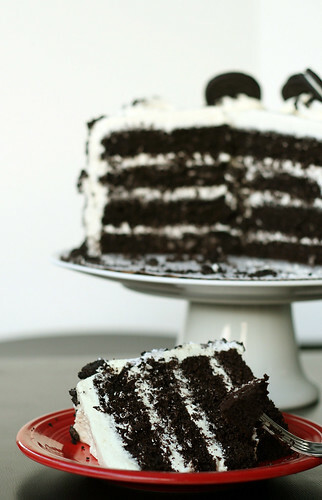 When all the layers are stacked, set aside 1/2 cup of frosting then use rest to frost the outside. Using a ziploc bag and a rolling pin, crush all but 6 of the Oreo cookies. 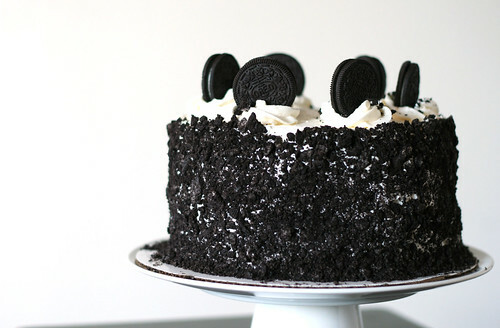 Apply the cookie crumbs to the sides of the cake**. Use the reserved 1/2 cup of frosting to create 6 swirls on the top of the cake, place a cookie in each swirl. Serve with a very tall glass of milk. 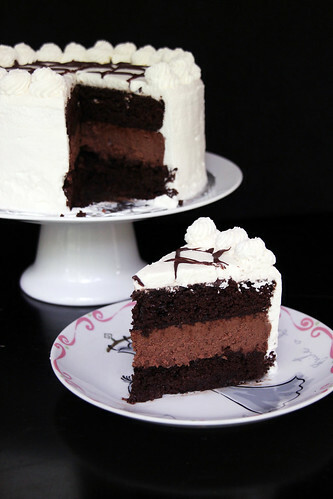 *If you don’t have cake leveler tool, you can use a knife to score the cake half way up all the way around. Then place a clean piece of fishing wire or floss in the groove and slice away. 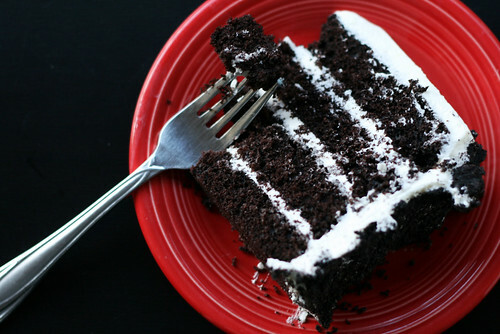 **I set my cake plate over a large piece of parchment paper to catch the extra crumbs. It can get a little messy. I’m a huge fan of cake!! Here are some of my favorites!